Yesterday was the hottest day of the year, and everyone at Kings Cross Supplementary seemed to be in a bit of a mood, certainly me. Small Boy’s disposition was particularly negative, it having been severely aggravated by the fact that his little Nintendo games machine was doing something “mysterious”. He used this word over and over again. I am impressed that at his age he knows such a word, and its precise meaning, but I couldn’t solve the problem, which was making the games machine work as Small Boy thought it should. Also he was coughing a bit, and I have yet to learn the medical diagnostic skills that are evidently part of the skill set of a Real Teacher. Was Small Boy actually ill, or just reluctant to have yet more Education done to him, after a day spent having it done to him at his regular school? We looked at maps of the world in a map book I had brought with me, and he pointed out different countries. I persuaded him to allow me to pronounce country names that he didn’t know. Namibia. Zimbabwe. Libya. He pronounced ones he did know. Morrocco. Egypt. Then he wrote, very badly, a list of countries, one of which was “United”. But I guess that names of countries are often rather confusing. How was he to know that United was part of United Kingdom when the Kingdom bit was quite a lot below the United bit? Smart Boy and Smart Girl both prefer talking with me to having Education done to them, but Miss Head Teacher was adamant. They must do sums in the class. The most memorable moment of the evening for me was when Mr Maths also made a speech. “Smart Girl, why are you wandering around? Sit down in your place. If everyone wandered around, there would be Anarchy instead of Order.” It was like in a movie, where the script writer has completely abandoned realism in order to explain the Underlying Point Being Made In This Scene, except that Mr Maths really said that. I’m afraid I was not much help to him, probably because I am an anarchist. But eventually I was able to contribute to the imposition of Order with the necessary mixture of prison guarding and maths tuition. So I guess that means I’m not an Anarchist any more. Seriously though, one interesting educational issue did crop up, which concerns the methods used to teach things like long division and “long multiplication”. (I’d never heard of that one before.) Every teacher and every school seems to use a different method for these things. There’s the “grid” method, and various others I can’t remember the names of. Do different methods confuse, for doing something like multiplying 57 by 34? Or do different methods throw light on the underlying things that are really going on, the way that speaking several different languages is supposed to make children cleverer by giving them an instinctive philosophical grasp of what language is (and is not) that other children are denied? I suspect that the clever kids – and all the kids at Kings Cross Supplementary seem pretty smart to me - do actually gain a bit from having sums that they find easy taught to them in an unfamiliar way. Just after writing all that, I went in to the Civitas Office to find out how I was doing, in their opinion. They were nice, but the message was unmistakeable. Less Anarchy, please. More Order. Today I was at Hammersmith Saturday again. Apparently there was some confusion in parental minds about whether this was the half term break, which for Hammersmith Saturday is not this week (as it already is for regular schools) but next week. Present were a mere five pupils, and five teachers (assuming I count), plus one teacher’s daughter, who joins in as a pupil or not as she pleases. So, I was pretty much surplus to requirements. I myself will not be attending Hammersmith Saturday for one Saturday in mid-June. When I revealed this news to Other Man Teacher today, he hardly panicked at all. So, what did I actually do today? One thing I did was sit down and, as a pretend pupil, do some of the arithmetic tests that Miss Maths sets her charges. I did this because (a) it will make me better at teaching arithmetic, which I want to get better at, and (b) because it does the children good, maybe, some of them, the ones who care, to see just how very very quickly, compared to most of them, mental arithmetic can actually be done by someone who is quite good at it. As I told Miss Maths, Rachmaninoff used to teach the piano by just himself playing the piano to his pupils. He didn’t make his pupils play, or tell them how to play. He just played. He set a standard. I was, in a somewhat more mundane setting and far more mundanely, attempting the same technique. It didn’t work, though. The ones that didn’t care didn’t care. The ones that might have were busy doing their own sums. But the main thing I did was just get to know a few of the children who were there that little bit better. I have long held to the theory that one of the Great Educational Divides in Humanity is between People Who Were Confused At School, and People Who Were Bored At School. Education Theory, for instance, is either elaborated to solve the problem of Confusion, or of Boredom, the Traddists being the ones who were Confused and the Progressive being the ones who were Bored. Two of the girls present were classic “I’m bored!” pupils. “I’m bored,” they said. “This is boring.” But one of the boys in particular is a classic Confused type. He doesn’t mind being bored, so long as he knows what he is supposed to be doing, and is left to get on with it. Children are different from each other. So, for instance, those two Bored Girls were being driven almost foetal-position with the tedium of the sums that Miss Maths was giving them. So after their ordeal, to cheer them up, I just sat down and had a conversation with them. This worked well. They are both highly witty and stimulating conversationalists, and conversing with them is playing to one of their strengths. (Women love to talk.) They soon cheered up. My playing-to-strength way of teaching arithmetic would be to find out what a kid really, really cares about, and find the arithmetic in that. Miss Actress, for instance, would be asked things like: how many lines are there in this Shakespeare play? How much money did Angelina Jolie get for her last film? If she got this for her last film, and this for the one before, and this for the one before that, etc., how much did she make in the last decade? Things like that. And as for all those boys who are going to be international footballers ... (By the way, the England team is going to have thousands of young men in it in fifteen years time.) Well, the Premier League is an absolute hotbed of arithmetic. I learned a lot of my mental arithmetic listening to cricket commentaries on the radio, and reading the scores in the newspaper. Well, that is what I would do with the Bored ones. With the Confused ones, I simply let them get on with their arithmetic, helping them with any confusions. 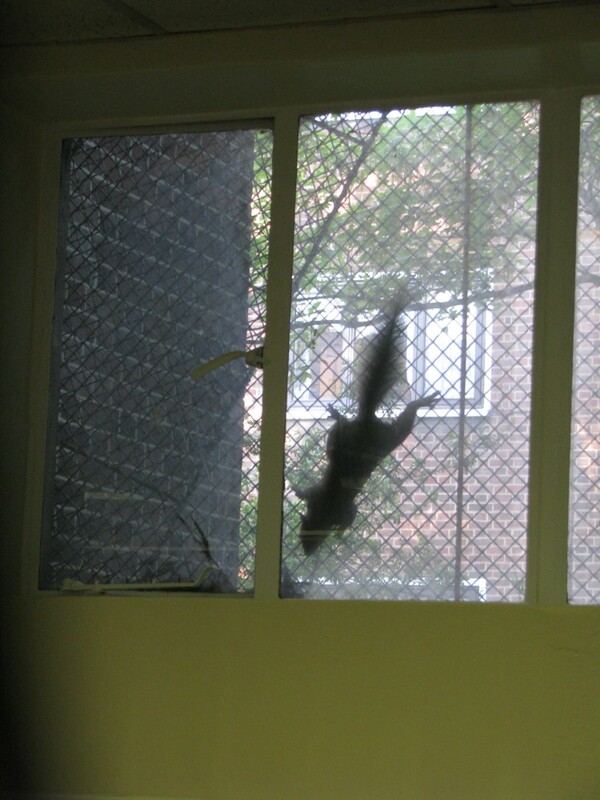 The most exciting thing at Kings Cross Supplementary earlier this evening was a squirrel, which had inserted itself between one of the windows and the grill that protects the window, presumably from missiles thrown by the Underclass. One of the children pointed it out to me, and my digital photography instincts cut in at once. Click to see bigger pictures. The snap on the right was taken first. What was happening was that the squirrel tried to climb out from behind the grill by climbing upwards, found that this didn’t work, and so had to come down again. 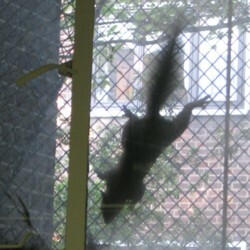 That’s the squirrel on its way down. 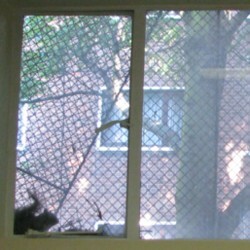 And the one on the left is the squirrel back at square one, wondering what to do next. It was soon gone though. I wish that, instead of merely photo-ing squirrels, I could comfortably take pictures of all the children, and then print their pictures out in a card index, and write their names on all the pictures. Because, you see, I have a real problem remembering all their names, yet doing this is basic courtesy. Teaching good manners, which we try to do, is a whole lot easier if you are being polite yourself. With photos, I could be more polite. But, the times we live in say you have to tread carefully about things like that. 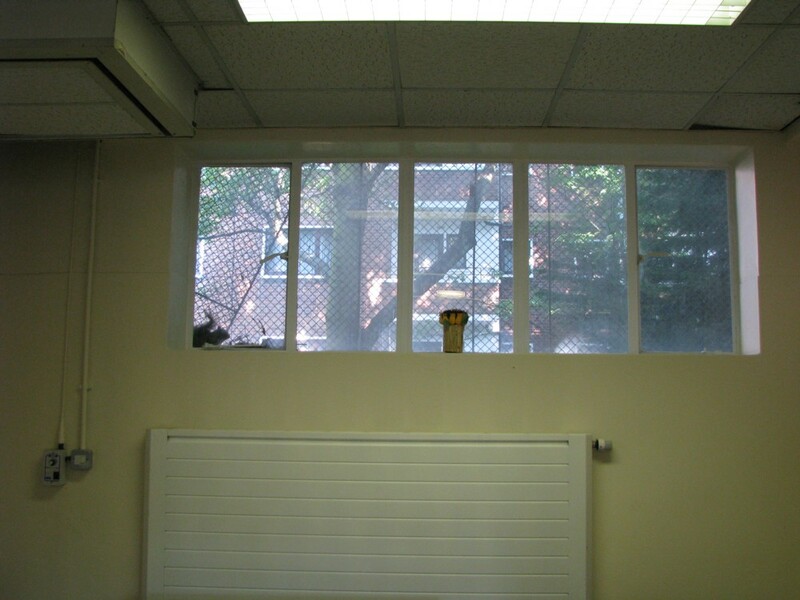 As you can perhaps see from these pictures, the physical conditions at Kings Cross Supplementary are fairly basic, with everything painted in institutional puke-yellowy-green. Which does not matter at all. The children are all very nice, to us and to each other.